As part of our continued regulatory compliance and environmentl responsibility programme, P&M Coppack Ltd have implemented electronic F Gas records since 2010 during which time thousands of our F Gas certificates have been produced digitally. By providing our customers with digital F Gas certificates and strict recording of service visits and gas transactions, we simplify the certificatation process and ensure that our clients and staff meet their obligations under the strict and ever changing F Gas regulations imposed in the UK. In November 2012 P&M Coppack upgraded to the EZ F-Gas® software system deploying Android devices to all our onsite service engineers. Our investment in EZ F-Gas marks a turning point in our onsite service department allowing engineers to respond more quickly and giving clients access to digital F Gas certificates by email often minutes after the onsite engineer has left the site. Our clients sometime require that mobile devices be used in “Airplane Mode”, previously this represented a problem for traditional mobile web based software. Our new system is capable of ad hoc syncronisation and can be fully used in “Airplane Mode” meeting our clients needs and improving staff safety. As part of the F Gas resulation in force today, Air conditioning and regrigeration companies are required to make accurate records of what gas has been recovered, delivered or lost during the working life of an appliace. 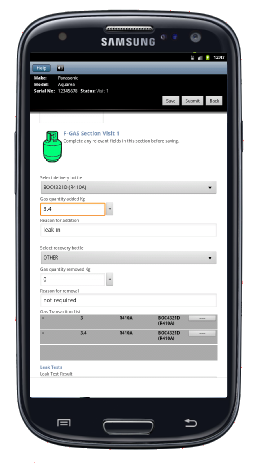 Our software automatically fulfills this requirement allowing us to view exactly the life of gas from delivery to return. Should our clients ever be reviewd by regulatory bodies we can quickly provide them with the required information relating to individual machines.